Fujitsu Laboratories Ltd. today announced that it has built a prototype wireless unit incorporating inter-subarray coding technology, which makes it possible to achieve high-speed transmissions, in excess of 10 Gbps, for 5G mobile wireless base stations and access points. It has achieved these high speeds whilst maintaining low power consumption levels on par with Wi-Fi. In verification tests, the prototype successfully transmitted signals simultaneously to multiple devices. In order to achieve 5G ultra high-speed communications, for which development is ongoing with the aim of practical implementation by about 2020, attention is centered on technology that uses the millimeter waveband and multiple antenna elements to simultaneously transmit signals as beams to each individual device. Currently, hybrid beamforming is being developed which could reduce the number of circuits, which consume a lot of power, by controlling both digital and analog circuits. However, this method has issues as interference occurs when sending signals to multiple devices, leading to reduced transmission rates. Now, Fujitsu Laboratories has verified the effectiveness of this newly developed technology that can reduce this interference, limiting the reduction in transmission speed while still achieving low power consumption. Details of this technology will be announced at the International Symposium on Personal, Indoor and Mobile Radio Communications (PIMRC2016), being held in Valencia, Spain, September 4-7. With the spread of smart devices, wireless data communications traffic volume has been almost doubling every year, and it is predicted that by about 2020 it will be 1,000 times greater than in 2010. For this reason, research into 5G mobile wireless communications technology that can achieve transmission speeds in excess of 10 Gbps has been ongoing around the world. Methods for increasing transmissions capacity include reducing the area radius covered by mobile phone base stations and Wi-Fi access points, thus increasing the number of devices that can transmit in a given area, or by using a wide bandwidth. High-speed communications using millimeter waves, which can make use of several gigahertz of bandwidth, may rely on mobile phone base stations and Wi-Fi access points installed at distances between a few dozen meters and a few hundred meters apart. This means that a large number of wireless systems are necessary, therefore reducing the power consumption of wireless systems is extremely important. 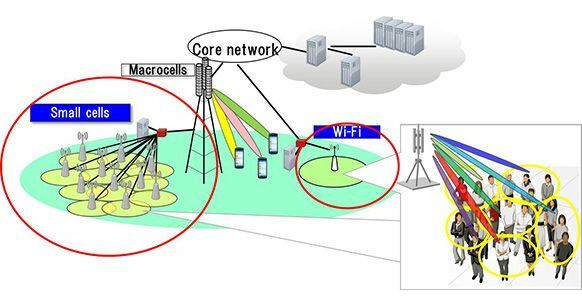 In the effort to achieve ultra high-speed 5G communications, attention is focused on the use of the millimeter waveband and on massive multiple input, multiple output (massive MIMO) technology, which control multiple antenna elements to send radio wave beams to each device. The antenna elements require D/A circuits, which convert digital signals to analog in order to send signals from the antenna. However, with the millimeter wave band, if digital beamforming is used where each antenna element uses one D/A circuit, multiple high-speed D/A circuits become necessary, creating the problem of increased power consumption. Therefore, by carrying out some of the signal processing in the analog antenna element, multiple antenna elements can be connected to a single D/A circuit, enabling power consumption reductions by reducing the number of D/A circuits. However, with this hybrid beamforming in which beams are generated in both analog and digital, the beams directed at end-user devices such as smartphones, interfere with each other leading to a reduction in transmission rates. For example, in a system with 128 antenna elements, and 8 multiplexed beams, the number of D/A circuits with hybrid beamforming can be reduced to one sixteenth that of digital beamforming, but because the multiplexed beams interfere with each other, the transmission rate falls to a maximum of one eighth that of digital. With an interleaved-type device, there is increased spacing between antenna elements within a subarray, which is a collection of antenna elements connected to one D/A circuit, increasing the subarray's area. 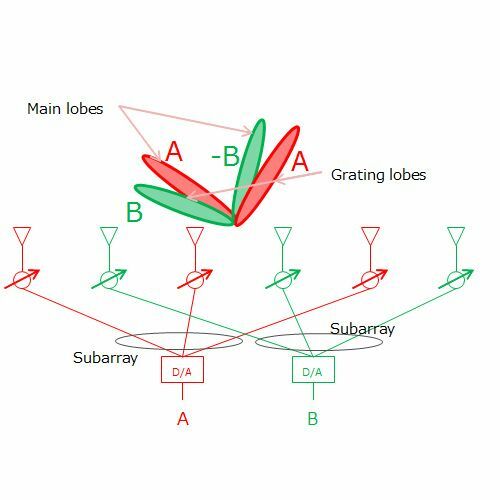 When an antenna's range is spread out, its beam becomes narrower, and as the antenna elements are spread out, a type of undesired emission called a grating lobe can occur. If the elements for different subarrays are placed alternately (Figure 2), then the signals from both subarrays, A and B, will both be sent as radio waves in both directions the arrays are transmitting. Signal A, however, will be sent in the same phase of radio waves in both directions, while, due to the positional relationship between antenna elements, the radio wave phase will change for B, depending on the direction. 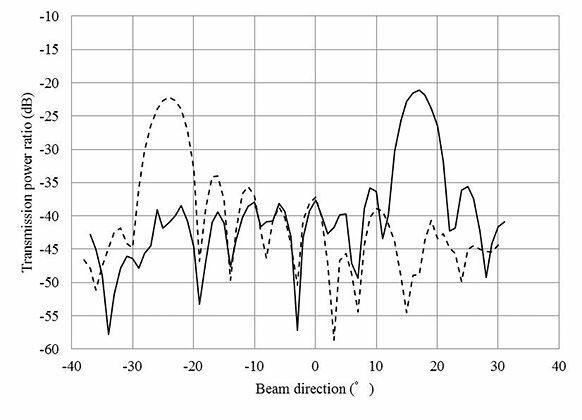 Using this characteristic, by coding the signal appropriately between subarrays (Figure 3), the interference can be cancelled out and the beam can be multiplexed. 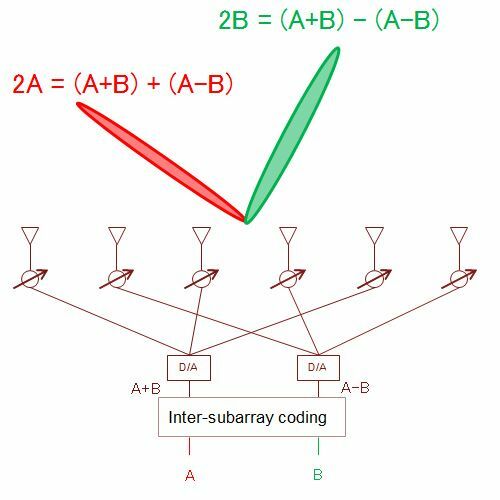 With this system, an A+B signal is input into one subarray, while an A-B signal is input into the subarray in the other direction, resulting in one direction having an (A+B) + (A-B) = 2A signal, leaving only the radio waves for signal A, while the other direction has (A+B) - (A-B) = 2B, leaving only the radio waves for signal B.
Fujitsu Laboratories has now developed an interleaved hybrid beamforming prototype with inter-subarray coding in the 60 GHz band, and confirmed the generation of a narrow multiplexed beam capable of ultra high-speed transmissions at 10 Gbps. With the use of this newly-developed technology, even if multiple users in a densely-packed area use their mobile devices at the same time, reductions in transmission rates can be minimized, enabling them to enjoy high-quality video streaming, providing a high-speed and stable communications environment, even when doing data-intensive activities such as uploading videos. 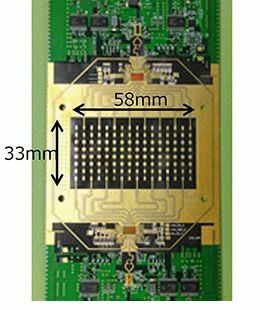 The use of this technology, which enables high-speed transmissions with low power consumption, is expected to advance the practical implementation of multiple mobile phone base stations or Wi-Fi access points in a narrow area for millimeter-band communications. Fujitsu Laboratories plans to work on further increasing the speed of wireless millimeter-band equipment and reducing the power it consumes per bit rate, with the aim of bringing it into practical implementation around 2020.